The 25 Days of Christmas Traditions Ornament Crochet-A-Long kicked off this week here on my blog (Click HERE for all the details!) and with it, I have an awesome giveaway for you all! 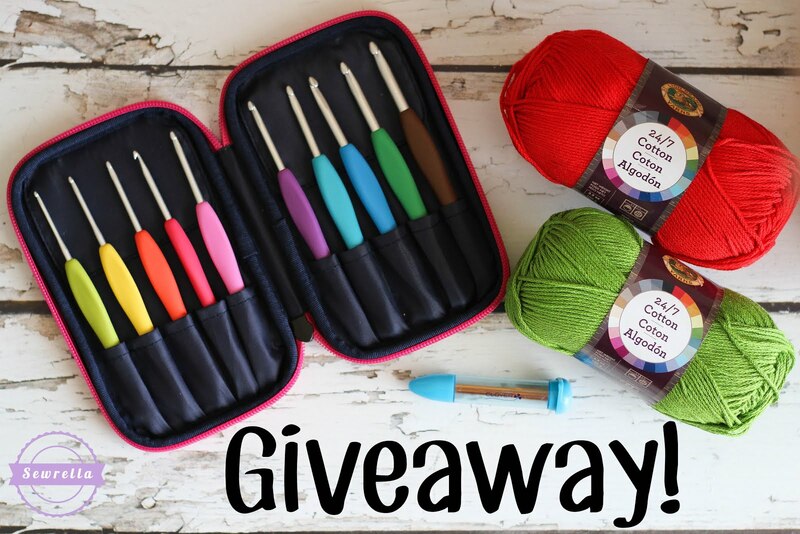 I’ve teamed up with Clover USA who will be generously giving away a bundle of crochet goodies! A set of their top of the line Amour Crochet hooks – these are my FAVORITE hooks to use and the only ones I’ll be using for this CAL! That’s 29 skeins of 24/7 Cotton yarn people!!! Just be sure you get your entry in by the end of our Christmas CAL – Thanksgiving Day! That’s it, good luck everyone! Is this open only to Americans or can someone from another country enter the give away contest too? This particular giveaway is open only to Americans, so sorry! If you live on border town like myself, I have also American address. Could I qualify? How about if I have a US address? Any US address is welcome! Where can I purchase the large wooden crochet hook that resembles a spindle? It looks very cool and also ergonomic! I hope I can win this package. I do not have twitter so I still have a chance . I would Love a set of the clover hooks! Wow! I only have 1 Amour hook and I love it!!! Thanks for the great give away! This is a awesome gift, I hope I win. Thank you! I have clicked here and clicked there and still don’t think I’m entered. This is such an amazing giveaway! Thanks for the chance! This would be awesome! TY! This is to die for!!! I would love to win these things. They look so cool and the articles look so nice together. Looks like something to fill those cold winter days. I love to crochet and think this giveaway is fantastic and in the Christmas Spirit. Thank you for making it possible to win needles and yarn that I normally wouldn’t have the opportunity to own. I won! Thank you so much for the chance to win this amazing giveaway. And a huge thank you for all your hard work and sharing these wonderful little ornament patterns!